Like the rest of the Chincoteage Island, just because it’s winter doesn’t mean the wild ponies of Assateague Island’s Chincoteague National Wildlife Refuge have been rolled up and stored away until spring! They’re still here and, as a matter of fact, as long as you don’t mind the lower temperatures, now can be the one of the best times of the year to see them as you wont be fighting the crowds. Has it always been a dream of yours to see the infamous Chincoteague Pony Auction? For many horse lovers and fans of Misty of Chincoteague, this event is something they’ve pictured hundreds of times. If the same goes for you, it is time to start thinking about planning your trip! This July will mark the 88th year of the pony swim. Tens of thousands of spectators from around the world will gather on our little Island to watch this annual tradition. In this blog, we are going to give you some advice for when you attend. 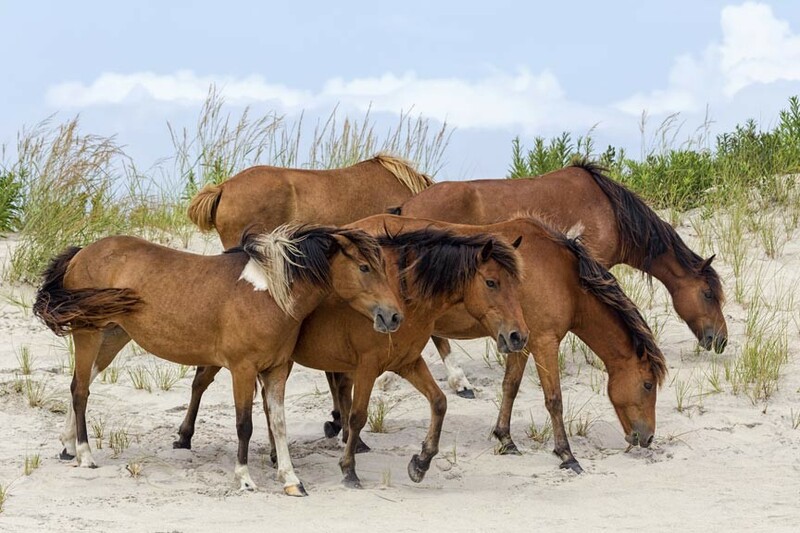 The weekend prior to Wednesday’s Pony Swim, the “Saltwater Cowboys” – the fellas that drive the ponies across the water on horseback – will begin rounding up the approximately 150 wild ponies that live on Assateague Island. Misty of Chincoteague was Written Here! When Marguerite Henry came to Chincoteague in order to research her new book, she stayed here, in our Victorian bed and breakfast. Even in 1946, when Henry visited, this beautiful home was in use as accommodations on Chincoteague Island for vacationers and the like. The owner of the property, Molly Rowley, was a young widow who brought boarders into her home as a way to make a living after her husband passed away. Henry would sit on the porch with Miss Molly and Captain Jack, Molly’s uncle, discussing thoughts and ideas for her new book, Misty of Chincoteague. Author Marguerite Henry with the real-life Misty of Chincoteague. While Marguerite Henry was on the island, she attended the Pony Penning and met the Beebe family. The Beebes included Clarence and Ida Beebe, as well as their two grandchildren, Maureen and Paul. 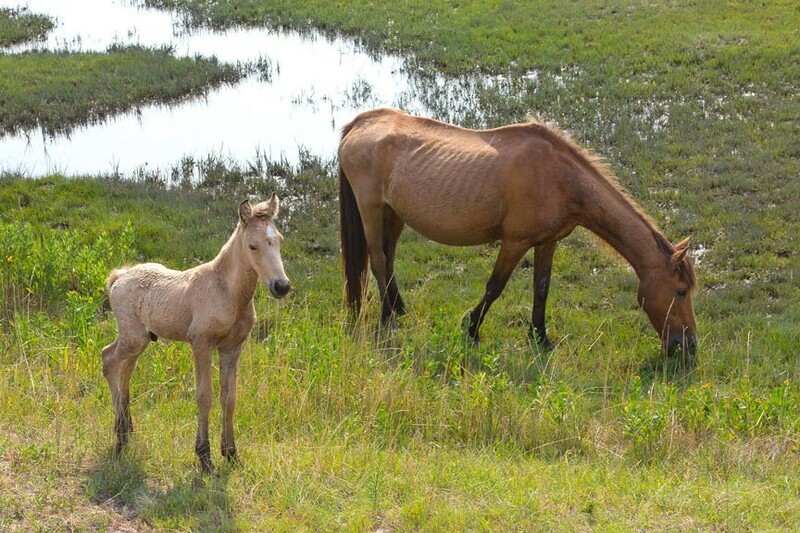 The real horse on which the book was based was actually foaled in domesticity on Chincoteague at the Beebe Ranch, not in the wild on Assateague Island as was told in the book. However, as in the book, Misty was sired by a stallion named Pied Piper, out of a dam called Phantom. Though these horses also were domesticated in real life, they too provided inspiration for the wild ponies portrayed in the novel. Henry fell in love with Misty and wanted to purchase her from the family, but Clarence Beebe knew how much the children loved the foal and refused to sell her. Eventually, an agreement was made between Beebe and the author, and Beebe allowed Henry to purchase the horse for $150 if she included his grandchildren in her next book! Henry followed through with the agreement and published Misty of Chincoteague in 1947, featuring Maureen, Paul, and the little filly as the main characters of the work. Misty continued to grow up on Henry’s farm in Illinois, accompanying the author on book signings across the country. Posted in Wild Ponies of Assateague Island | Comments Off on Misty of Chincoteague was Written Here! 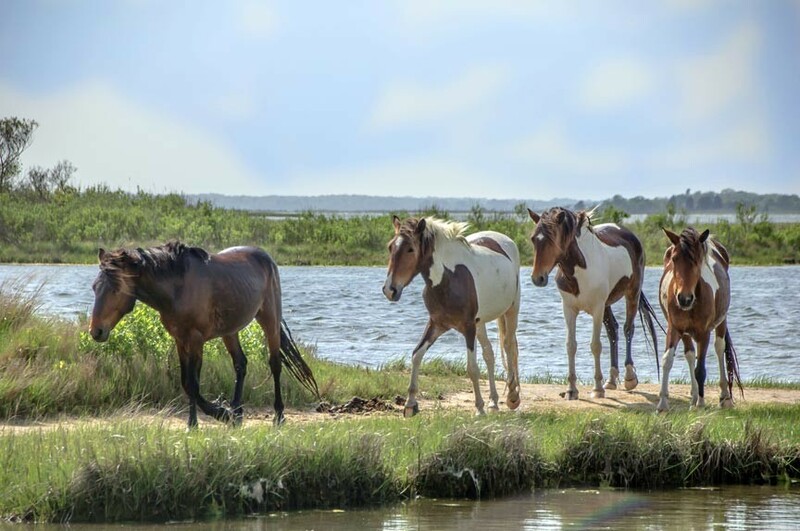 Each July, thousands of people from all over the world come to the small island of Chincoteague to watch the wild ponies swim across the Assateague Channel. 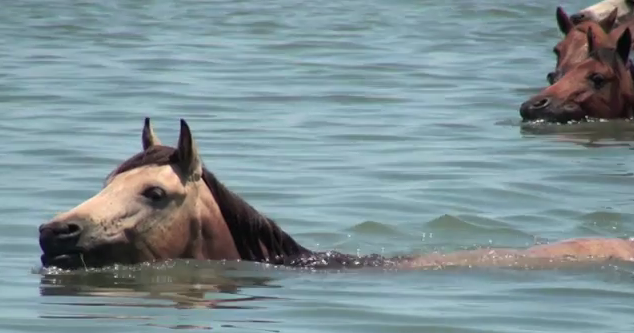 Witness the Chincoteague Pony Swim this year. It’s a festive occasion. People get up early and cast about for the best vantage points. Those who brave mud and water are rewarded with spectacular views of the horses as they come ashore. Everyone encourages the horses with cheers. Everyone feels happy and relieved when they finally make it across. 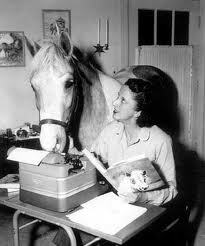 Misty of Chincoteague was written in 1947 by Marguerite Henry. The story was inspired by a real Chincoteague Island pony named Misty. Although the real Misty was foaled in domesticity rather than in the wild, the book heaped pique the nation’s curiosity about the wild horses of Assateague (they are called ponies because of their small size, but they are actually horses). Born free: the wild ponies of Assateague Island. 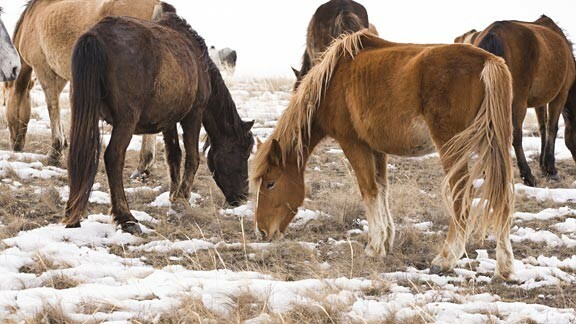 It has long been a tradition to cull the wild pony herd in order to protect both the horses and their habitat. The Annual Pony Swim first started in 1924, and it has done nothing but grow since that time. In recent years, approximately 150 wild ponies are rounded up each July and made to swim across the Assateague Channel to Chincoteague Island. Once there, many of the foals are sold in an auction; the remaining herd swims back to Assateague a few days later. 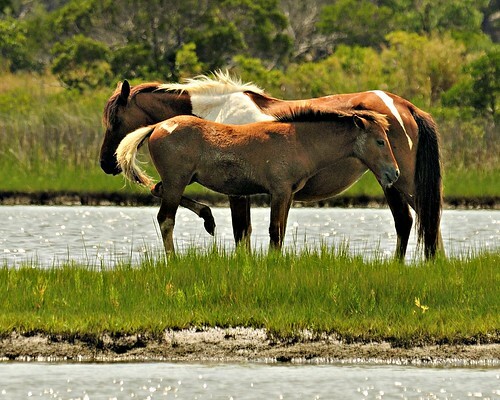 Wild ponies have lived on Assateague Island for approximately 400 years. No one knows for sure how the first ones ended up on the island. Perhaps Colonial settlers allowed their horses to graze on the island, and some turned wild and stayed. Perhaps wild horses from the mainland swam to the island and stayed. Perhaps a Spanish galleon ship carrying a cargo of horses sank near the island, and the horses swam ashore and lived. It is a fun puzzle to consider, but the truth doesn’t really matter. What matters most is protecting the wild ponies that live on Assateague today. Marguerite Henry, who visited Chincoteague and Assateague Islands, found a compelling story in the wild ponies, and she wrote it. Thanks to her, millions of young people have learned about the amazing wild horses that make their home on an island in the Atlantic. Many of those children grow up and eventually travel here to see the wild horses. Some of them stay at our Chincoteague Island Bed and Breakfasts. Marguerite Henry herself stayed in one of our Chincoteague B&Bs, Miss Molly’s Inn. Stay in the room where she once stayed. Perhaps you’ll feel inspired to create something enduring, as well.